Lt Joe Hannigan and I were walking in the jungle. He was right in front of me when he stopped short. I had no idea why, but the guys in front of us were getting way ahead of us. I leaned in and said his name, but he did not respond. I said his name again but still no response from him. He just stood there like a tree. That is when I came around him and he was pale as a ghost. 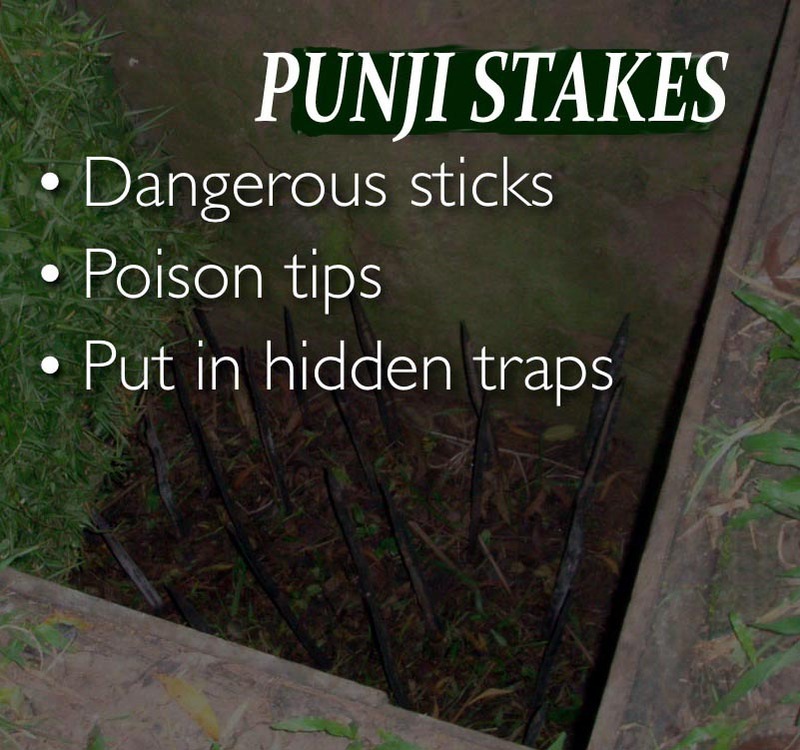 Then I looked down and saw a Punji Stake sticking through his ankle. I grabbed him and lowered him to the ground and yelled for a medic. We called for a Medi-Vac and 10-15 minutes later it arrived and he was off to the Evac Hospital. I told him I would see him soon, figuring he be back in a few weeks or so. That was the the next to last time I saw him. Not too long after that, I ended up in the hospital. I slipped and fell climbing out of a steep ravine on the way down I stuck out my hand to break my fall. In doing so, I managed to get stuck, impaled in the center of my palm. It was more blunt trauma but the reed/stalk had broken off and had a sharp point which managed to break the skin and leave lots of splinters imbedded in my palm. When I got to the top of the ravine we were taking a break and sitting there picking out some of the splinters. That's when the medic came over to work on my hand. After he got out the rest of the splinters, he cleaned it and put some antiseptic and a bandage on my hand. He said when we get in to base camp, I should follow up at the Aid Station. Next morning we flew in for a well deserved 3-day stand down. I went to the Aid Station and the medic cleaned it out again and re-bandaged my wound. I was on my way. Went to NCO club that night. Got back around 0100 hours or so and passed out on my cot. Woke up around day break and could not move my left arm and it was throbbing along with my hand with excruciating pain. I reached for my trusty Zippo lighter to get a look at what the heck was going on. When I lit it, I almost passed out. My hand was swollen as big as a boxing glove. My fingers were as big as sausage And splitting where my finger prints are. Soon as it got close to 0700, I got up and ran to the Aid Station. The medic was just arriving and was looking at my hand; he looked like he was about to faint. Just about that time, the doctor walked in and took one look at my hand. He immediately pulled up my shirt sleeve and he noticed a reddish pink line running the length of my arm almost to my shoulder. He yanked me out the door and rushed me to the Evac Hospital. As soon as we arrived, I was stripped of my cloths less underwear. Next thing I know he and several medics were working on me and stick me with needles; I assume it was antibiotics. At the same time the Doctor was soaking my hand in extremely hot water and squeezing it very hard. I was yelling my brains out with the pain being so intense. I had no idea what he was trying to do but it felt like my hand was going to explode and or break. After about 45 minutes or so of this, I finally felt a snap and or what felt like a pop in my hand. Then I saw this thick goo start oozing out of my hand and the pressure & pain started to subside. The Doctor then let out a sigh of relief. He kept this up for some time after till the oozing subsided. I spent the next two weeks there getting stuck around the clock with antibiotics. In between, Joe and another officer who was with our unit came and visited with me. After he left, that was the very last time I saw him in Nam. We made contact years later and he told me that he got re-assigned to a different Division altogether and finished his tour with them. If you go to my Photo Gallery on the web-site, there is a picture of me and Joe on the last page. Amazing if you look at us when we were in Nam.